The young boy Qasim jogged his way to the only working water faucet in the ruins he lived in since the end of the last World War. His emaciated body ached with every step, and his throat felt as if coated with dust as he glanced at the empty cup in his hand. Reaching the broken wall with the faucet, he put his cup under the faucet and turned it on. He frowned as a brown liquid that started to fill his cup. Why? this color... Why does it look like this? Qasim hesitantly drank the water. It was the only water they had, even if he couldn’t get used to the bad taste. There wasn't any better alternative here, since all the good water had long gone. The whole world was facing the same water crisis and this place wasn't the worst. The Oceans, lakes, wells and every other water source succumbed to pollution. Qasim tightened his grip on the cup as he heard the sound of an engine. He looked around but failed to locate its source. Qasim found it weird to not find something this loud here in the open even if the sound echoed everywhere. "There." Qasim spotted a helicopter in the sky. He ran through the wasteland to his home. "Dad! Dad." He entered through the decayed door, and climbed down the stairs to his father's lab. "The surveyors are here again." His father’s name was Abbas, but He was better known by his kunyah “Abu-qasim”. Abbas was as emaciated as his son. Sitting at a table filled with tubes in the dimly lit lab. the man was working with his chemicals. "They still search for pure water?" His father didn't turn towards him. "The last ten years took away all the drinkable water from the earth, they'd be better if they used their precious fuel for something else." "We can survive by drinking this polluted water." His father turned to face him. "But since the war, all the rain became acidic. Most of the plants are dying and only few animals survived extinction. In few more years we won't have anything to eat." Qasim thought of the tomatoes he planted the other day, and how they died in just few days. His father took a test tube from his table and said, seemingly to himself. "What we breathe, drink and eat is poisoning us... Killing us. Maybe we can find a way to purify it. Qasim looked down. Too many people he knew… family and acquaintances, have died because their body couldn't handle this murky water. His father predicted that if they kept on drinking this water, most people here in the ruins couldn’t survive more than five years. But with the lack of alternatives, five years seemed enough time to look for a solution. His father must have noticed his sadness, as he heard him tapping the table a few times with his finger. Once he looked up his father said "But we have hope." "Yes Daddy." Qasim smiled weakly, and moved to his father in front of the table. "You're one of the doctors who survived the war." He picked up a small tube that contained a green liquid. "And this discovery of yours lessens the damage of our water and removes the bad taste." "It's just a prototype." His father took the tube from him and frowned a bit. "It takes a lot of resources and it might not help, so don't get your hopes too high. But you and our neighbors volunteered to test it despite the risk. God bless you all." Several days before, Qasim had helped his father by inviting people to the announcement of his discovery. His father’s speech at the time was inspiring he was glad he’s the son of “Abu-qasim”. 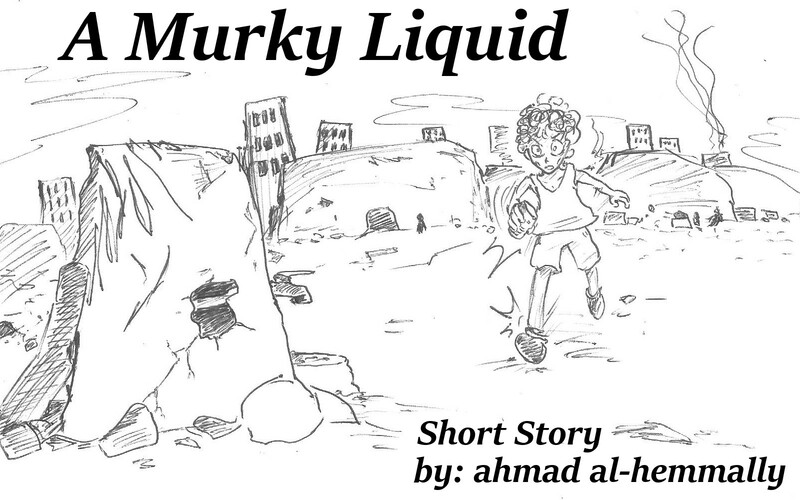 "I'm afraid this liquid might have dangerous side-effects.” His father warned them. “If only I had my old equipment to research it more, or if I could find one of my colleagues to help me... But since we all the communication methods no longer function, I won’t be able to. I can't leave the ruins to look for them if I don't know if they're alive." His father said that his liquid while it might make the water more clear it might also contain an invisible poison. That he tried to confirm the purity level of the water purified by it, but he can’t be sure. Despite that many of them volunteered. They knew they’re going to die anyway. Looking as his father picked up a tube from the back of the table, Qasim realized that his father wasn't experimenting to find a new chemical; if he were there'd be more opened glasses in front of him. "So, are you making more of the green one?" "Didn't I say it's just a prototype?" His father smiled at him as he poured some of his liquid in a glass of the murky water. "This water isn't only water. Instead of pure H2O it's full of impurities. My invention interacts with these and normalize them... The composition and taste becomes cleaner. I'll get rid of all impurities eventually"
"Maybe tomorrow, maybe in five years..." The Father’s test tube’s water turned less brown and more transparent. "But we must succeed quickly. The next war will commence for the water even if polluted. Those who don't study history are doomed to repeat it. I'm afraid it'll happen soon." “You remember that?” His father asked, and Qasim smiled. It was probably a speech he heard when he was younger, when the war was still raging and there was still a TV political people could appear on. He didn’t remember much about those days with all the survival he had to do in the next years. But that speech stuck in his mind. He knew that his father wanted to spread the formula, but since they both were being perfectionists he knew that his father wouldn’t stop until no impurity left in the water. It’s time for the next step… to return our world to the way it was. Qasim looked looked one last time to the green liquid on his father’s table before catching up with his dad to the outside of the lab. Vowing once more to see a world he couldn’t remember. A world where the water can be a colorless, scentless and tasteless liquid again. The name Qasim (قاسم) is an arabic name that means “The one who Swore/Vowed” (not the bad word, but making a vow of something big)... Qasim is a common male name… The female equivalent of it is “Qasima or Qasimah” but I never saw a girl with that name.. I think it’s very uncommon for women. ِAbu-qasim isn’t actually a name. It’s the arabic for “Father of Qasim”, but you see, In some of the arabic countries fathers are called as “father of X” instead of their given name, mostly with their first born “son” name but sometimes their second born (almost never their daughter and called by given name if they only have daughters). This is called Kun’yah (or kunya according to Wikipedia) and it shows respect. This was too common hundreds of years ago that some famous people are only known to our generation by their Kun’yah. These days most Arabian communities call people by their given names or “titles”. There are countries (some Asian countries) where referring person by his kun’yah is still common. One of the most famous people in Islamic world is “Abu-Bakr al-Siddiq” (The “truthful”) is the closest friend of our prophet Muhammad… some people think that Abu-bakr is his name but in reality it’s his Kun’yah… His actual name is “Abdullah Ibn Abi-Quhafa” and Bakr is his eldest son. It’s terrifying to think how many Muslims don’t know that even those who consider Abu-Bakr the number one Islamic figure after our prophet Muhammad. This story is free without paywall and it's already released on steemit but tips are welcome. I took help from some people on that platform to edit/improve it. To steemit community who helped editing this story, to my family and Arabic Mangaka community which I whom the story for in the first place. And Yours.org readers for reading, tipping and commenting on this post. "They still search for pure water?" Qasim asked. His father didn't turn towards him. Anyway, I don't have an English degree or anything, but those are some of the things I noticed. Maybe when I post some fiction you can do me the same favor of giving me your impressions. I would love to see more fiction on this site. And it's too hard to go through the whole thing here as a comment, but an obvious error is in the second to last paragraph, you repeat the work "looked" back to back. I find that reading a story out loud helps find things you might miss reading in your head. Scary story! I really liked the notes at the end. It's nice to come across your content! I haven't seen your bitcoin comics since on reddit a year or two ago (I think you're the same guy)!